The online version of this article ( https://doi.org/10.1007/s12520-019-00820-9) contains supplementary material, which is available to authorized users. As part of our paper we evaluated differences between stable isotope ratios of geographic units as well as between livestock taxa. We incorrectly used ANCOVA (analysis of covariance) when we should have used ANOVA (analysis of variance) which compares variation between groups. We have re-analysed all of the datasets and found that the significance of our results changed slightly, leading to an increase in significant differences between groups (see bold text). However, our overall discussion has not changed and these findings offer further support for our previous conclusions. Significant differences were identified in average δ15N values between all units at the site of Bestamak (ANOVA, p = 1.45 × 10−11; Correction Supplemental Table 3). Units were then combined into three vegetation communities including the open steppe (OS), areas of anthropogenic activity (AA) and riverine, salt lake, and marsh (RSL). Significant differences in δ15N values were identified between the plants in the open steppe and those in areas of anthropogenic activity and near water (ANOVA, p = 1.45 × 10−11; Correction Supplemental Table 3). No statistically significant isotopic variation was evident in carbon isotope values between units or vegetation communities (Correction Supplemental Table 3). Isotopic variation between collection units at Lisakovsk (n = 4) indicates that significant differences were identified in average δ15N values between unit 5013 and the other units (ANOVA, p = 5.43 × 10─6) and statistically significant isotopic variation was evident in carbon isotope values (ANOVA, p = 0.04; Correction Supplemental Table 3). Unit 5013 has a significantly lower average nitrogen isotope composition than other units by 3.2‰ (Correction Supplemental Table 3). Domesticated livestock, including horses, cattle, sheep, and goats were recovered from the Bronze Age sites of Kamennyi Ambar, Bolshekaragansky, Bestamak and Lisakovsk. Different livestock taxa from these sites yield different average values with significant differences in average δ13C and δ15N values by taxa (Fig. 4; Table 5; ANOVA, δ13C p = 4.79 × 10─9, δ15N p = 3.98 × 10─4) (see Correction Supplemental Table 4). Inter-species carbon isotopic distinctions were visible across sites where horses were depleted in 13C on average by 0.7 to 1.5‰ relative to cattle (Tukey post-hoc HSD, p < 0.0005) and by 1.2 to 2.3‰ relative to sheep/goat (Tukey post-hoc HSD, p < 0.0005). We further found significant differences between cattle and sheep/goat when all sites were combined, with sheep/goat enriched 13C on average by 0.6‰ relative to cattle (Tukey post-hoc HSD, p = 0.0059). Kamennyi Ambar livestock exhibited the widest range of δ13C values from −20.8 to −17.1‰, while at Bolshekaragansky, δ13C values ranged from −19.7 to −18.5‰. At Bestamak, δ13C values ranged from −20.0 to −17.7‰, and at Lisakovsk, livestock had δ13C values ranging from −20.8 to −18.7‰. At Lisakovsk (ANOVA, p = 2.18 × 10─6), a significant 0.9‰ depletion in 13C is visible in horses relative to cattle (Tukey post-hoc HSD, p < 0.0005) and a 1.2‰ depletion relative to sheep/goat (Tukey post-hoc HSD, p < 0.0005). 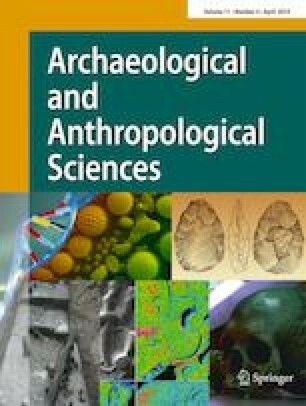 Carbon isotope differences between species were also significant at Kamennyi Ambar, (ANCOVA, p = 4.31 × 10─6), with significant differences identified between sheep/goat and horses, as well as horses and cattle (Table 5; Correction Supplemental Table 4). Horses were depleted in 13C, on average by 1.1‰ compared to cattle (Tukey post-hoc HSD, p = 0.0048) and by 1.9‰ relative to sheep/goat (Tukey post-hoc HSD, p < 0.0005). Significant nitrogen isotopic differences were also visible between taxa and between sites (ANOVA, p = 3.98 × 10─4) (see Correction Supplemental Table 4). Horses were depleted in 15N relative to cattle at all sites, on average from 0.7 to 2.2‰ (Tukey post-hoc HSD, p = 0.0047), and horses were depleted in 15N by 0.8 to 2.8‰ compared to sheep/goat (Tukey post-hoc HSD, p < 0.0005). Kamennyi Ambar livestock exhibited δ15N values from 3.2 to 9.8‰ and δ13C values ranging from 4.7 to 6.9‰. A similarly low range of nitrogen isotopic variation was visible at Lisakovsk, with δ15N values ranging from 4.3 to 8.3‰. At Bolshekaragansky, livestock exhibit δ15N values ranging from 4.7 to 6.9‰, while at Bestamak, δ15N values range from 6.2 to 8.4‰. Significant differences were evident in nitrogen values between species at Kamennyi Ambar (ANCOVA, p = 0.0035) but not at Lisakovsk (ANCOVA, p = 0.176). Comparatively, livestock from Kamennyi Ambar had a wider range of carbon and nitrogen isotope values than those from Lisakovsk (Table 4; Fig. 4). At Kamennyi Ambar, horses were depleted in15N relative to cattle, on average by 2.1‰ (Tukey post-hoc HSD, p = 0.0426), and horses were depleted in15N by 2.8‰ compared to sheep/goat (Tukey post-hoc HSD, p = 0.0031).